Kayaking is a popular outdoor activity in the Victoria area. The harbour area, Juan de Fuca Strait and the Gulf Islands create protected waterways that make kayaking in our area very accessible with great scenery and plentiful wildlife viewing opportunities. We’ll start from the most difficult area to paddle to the easiest – in our experienced opinion. No. 1: Discovery Island – Launch Location: Oak Bay Marina parking Lot. Features: The Chain Islets have a sea lion colony and plenty of harbour seals that you can paddle past on your way to Discovery Island. The channel crossing once you pass the Chain Islets can create challenging paddling conditions with strong currents sweeping around the south of Victoria and into Juan de Fuca Strait. Wind conditions can create some rip currents as you cross Plumper Passage. Once you reach Discovery Island there is a Parks Canada campground. Recently it was closed due to a wolf living in the area and to protect its habitat. Check with Parks Canada before you go. There are many currents curling around Discovery Island. Best Tip: Check your tide and current tables carefully before you go out kayaking in this area! This is an advanced kayaking area. No. 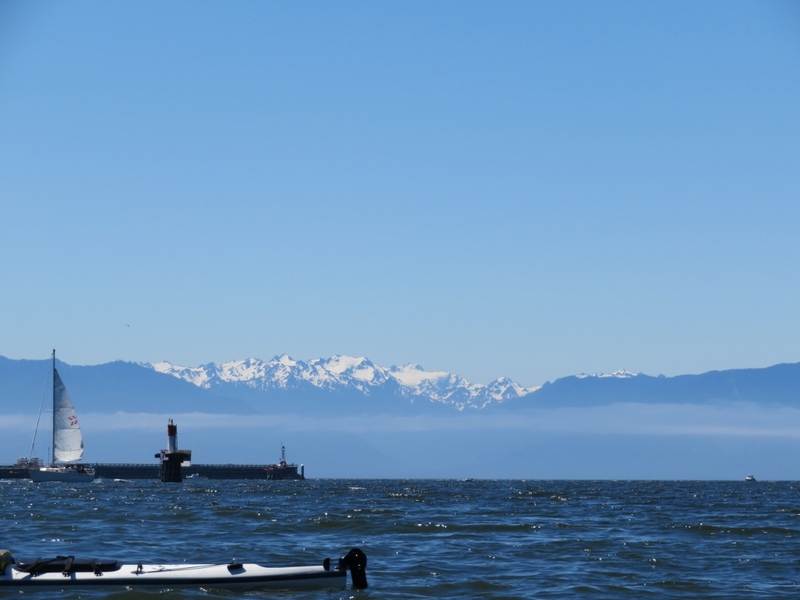 2: Sidney – Launch Locations: Land’s End or the Sidney public launch Features: The biggest challenges kayaking in this area are the heavy boat traffic and of course the BC Ferries routes that arrive and depart in Sidney. With careful homework before you leave for your kayak outing you can enjoy some lovely west coast paddling in this area. Sidney Spit is a long stretch of sandy beach that is a good intermediate/ advanced paddle from Sidney with some strong conditions as you cross channels. Many kayakers plan an overnight trip to Portland Island in the south Gulf Islands. There is a great shell beach and a small campground on this island as well. Best Tip: Obtain a marine chart of the area and familiarize yourself with the islands. Research the ferry schedules online before you head out so you avoid the heavy BC Ferries traffic. No. 3. BC Marine Trail – Victoria Loop Launch Locations: You could launch from a choice of a few public docks on the Gorge Waterway or at Fleming Beach in Esquimalt. Features: This is a continuous paddling loop with a portage in one part of the loop. Paddling under the Tillicum bridge can be very challenging at full flow or full ebb. It is best at slack tide.You will paddle in protected waterways, in two harbours and out along the coast of Juan de Fuca Strait from Fisgard Lighthouse. Time your paddle to coincide with the tidal flow, the wind conditions and tide height. I have heard people say that trying to portage kayaks (carrying a boat over land) through shin high muck at lower tide heights is not a pleasant task. This loop covers a long distance. You will need up to 6 hours depending on how fast or slowly you paddle. Best Tip: Pack a very light kayak with your gear in a backpack so you can carry your kayak over land more easily. No. 4. Brentwood Bay – Todd Inlet – Launch Location: Public beach near the Ferry Bridge Features: Brentwood Bay is a semi protected bay with many marinas and boats moored. Todd Inlet is a very protected inlet reaching around to the old docks from the quarry that is now Butchart Gardens. Todd Inlet is very protected and is a good kayaking destination for beginners. Brentwood Bay is somewhat more challenging due to wind conditions and boat traffic. You must paddle through part of Brentwood Bay to get to Todd Inlet. Best Tip: Be sure to check wind conditions before launching. The beach is somewhat awkward to launch from. No. 5. Sooke Harbour – Launch Location: There is a parking lot at Whiffin Spit in Sooke with a beach on either side of the spit that you could launch from. Features: Sooke Basin is protected by the spit reaching most of the way across the harbour opening. It is a large, fairly protected body of water to kayak in. It can have some wind and fog conditions depending on weather patterns. Fishing is very popular which means more boating traffic near the marinas. Best Tip: Familiarize yourself with the traffic flow in the harbour to avoid heavy boat traffic. Check the wind and weather forecast carefully. No. 6. Seal Island to Fisgard Lighthouse – Launch Location: There is a public dock at Fleming Beach with excellent parking. You can launch off the beach or the dock. The beach area is protected by a breakfront. Features: This part of Juan de Fuca Strait is magical to explore. It has several harbour seal colonies at the many islets scattered along the coastline. It can be very calm but it can also have some wind conditions. The prevailing winds are southwesterly in direction. This is an ideal place to experience marine wildlife as you kayak along. There are a few public beaches you can land for a picnic, Saxe Point and Fisgard Lighthouse, although the islands are all off limits to landing. There is only one very small current off of MacCauley Point which is about eight paddle strokes wide. Many times it isn’t presented at all. If you do land at Fisgard Lighthouse you will need to pay the Park Fees. It is best to arrange ahead of time. You can paddle into Esquimalt Harbour but will need to communicate with the Navy via radio for permission in certain areas. You can see we are partial to this area because this is the where we operate our kayaking tours in Victoria . Best Tip: Be sure to know your wind reports for the duration of your kayak trip in this area in case of changes. It is good to know tide times and heights to avoid submerged rocks. No. 7. Victoria’s Harbour – Launch Location: This can be a bit tricky as most access to the harbour is private. I would suggest the public dock off of the galloping goose and Harbour Road. You may need wheels to get down to the dock from your car. Features: Victoria’s harbour is a very busy place with float planes landing and taking off, harbour ferries transporting people, boat traffic, two huge ferries and many non powered vessels. There are very clearly defined paddling routes and access. It is very important to familiarize yourself with the Victoria Harbour Authority map which outlines the traffic flow in the harbour. It is cool to see the city sights from the water. This is a very urban paddle. Best Tip: Obtain a harbour map and know where you can paddle and where you cannot! No 8. Gorge Waterway – Launch Location: There are two optimal public locations for launching your kayak. One is in Banfield Park and the other is off of Harbour Road. You will likely want kayak wheels to get to each dock from your vehicle. Features: The Gorge Waterway is very long inlet that originates under the new Johnson Street Bridge and continues under four bridges to Portage Inlet. The first part is a very industrial, working harbour until you get past the first Bay St bridge. This part can be more exposed to wind. Once you get to the trestle bridge things turn into a lovely, very narrow “lazy river”. This is an excellent place for beginners to paddle. There are many users on this waterway from SUP, kayaks, rowers, dragon boaters, swimmers and inner tubes. There is some motorized boat traffic as well. There is a very occasional harbour seal or river otter sighting in this area but not often. One word of caution is the reversing falls under the Tillicum Bridge. This is best crossed at slack tide. It can have a strong current at full ebb or full flood. Check the current tables online for accurate timing. Best Tip: Be prepared to share this park-like urban waterway with many users. No. 9. Elk Lake – Launch Location: There is a beach at the side of the rowing club or opposite on the other side of the lake. Both are not far from your vehicle. Features: This is a wide, large freshwater lake – easier on your kayak than the salty ocean! There are a few wetland environments to explore along the shoreline. This lake can get windy if you are in open and exposed areas. This is a premier location for rowers in training! Best Tip: Know your wind direction and strength. Watch out for the rowers. No 10. Thetis Lake – Launch Location: You can launch your kayak off of the beach at Thetis Lake. You may need to drop your kayak and then go park your car. Features: This is a picturesque, lovely, smaller lake with a hilly, rocky shoreline. There is a small island to paddle around or get out and explore. This lake is a popular swimming destination in the summer and can get busy. Best Tip: Plan a picnic! « Oh so Cute Harbour Seal Babies!